Hey everyone and, thanks for coming back for another Monday Money post! Last week we talked about ways to be modest about spending your money. I figured one of the best ways to follow up on that is to teach you ways to reduce what you spend on credit card debt. 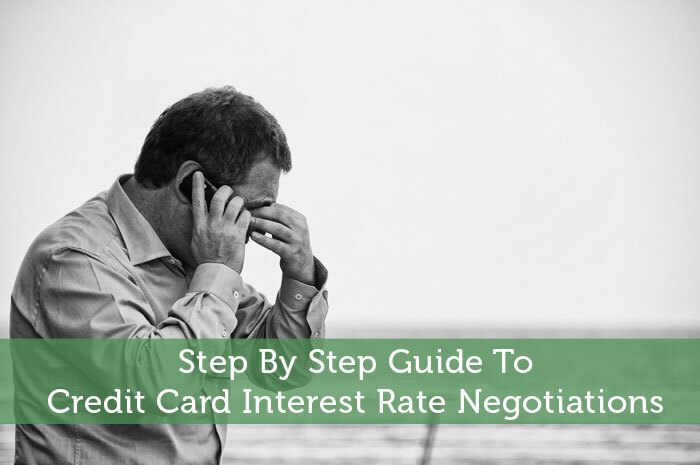 It’s no secret that the overwhelming fee associated with credit card debt is interest rates. It should also come as no surprise that quite a few people feel they pay an interest rate that they don’t think they should have to pay. And, most of them are right! Step #1: Get Your Ducks In A Row – Before you can start hiring contractors to build a home, you need the blueprints! Before you do anything in life, especially anything involving finances, it’s always important to do a little prep work to make sure that you’ve got everything you need. That being said, getting ready for the interest rate reduction calls is a pretty simple process. All you need to do is make a spreadsheet that includes all of your debts and sort the data from highest interest rate to lowest. Also, do a little bit of research on balance transfer credit cards if you aren’t quite sure what they are and what is available to you. These cards are going to be your ammo against the lender when it comes to negotiations. Start by calling the lender that charges you the highest interest rate. When you call, you will most likely be greeted by an automated system. Choose the option to speak with a live representative. When the live representative asks you how they can help, say something along the lines of, “I was going through my credit card bills today and wow, my interest rate is pretty high here. I keep getting balance transfer offers in the mail but, I figured I’d give you a call to see if you could do anything to keep my business. After all, the transfer would be a hassle. (chuckle)”. In this simple statement, you have told the lender that you are unhappy with your current credit card interest rate and, if they don’t fix it, they may just lose your business. The last crack at the balance transfer offer is to bring light into the conversation and show the representative that you’re not just another angry customer that is on the verge of yelling at them. Step #3: Go With The Flow – When they respond, simply go with the flow of the conversation. If you are transferred to a client retention department, go over step #2 again. There generally is no negotiation in this process. I honestly don’t know why this process has taken on the name “negotiation”. The truth is, if you are polite, the representative will do everything he or she can to keep your business. At the end of the conversation, you will know if you qualify to receive a lower interest rate! Once you’ve finished with your first lender, continue calling each and every lender on your list. Keep in mind that you will be successful around 50% of the time. What About The Debt With Lenders That Refuse To Reduce My Rates? You have to expect that not all lenders are going to reduce your rates. The good news is, you’re not just bluffing with the balance transfer credit cards statement. The truth is, this might just be an option for you. That being said, I recently wrote a guide on understanding, applying for and using balance transfer credit cards. Feel free to go through the guide and decide if they are a good option for your debts that remain at high interest rates. I have had some luck getting my interest rates lowered. If your credit score is good and you ask in the right way it is very possible. I have also had a company tell me no but to check back in three months to see what they are offering. So, it is very plausible to get your rate lowered. BTW, really liking the new blog design. Looks fantastic! That happens often. This may be a sign of a silver lining however, after tracking what happens after 3 months time and time again with clients, I’ve come to the conclusion that this is more of a retention process to deter you from considering balance transfer credit cards. I canceled a card once just because they wouldn’t work with me. Their terms were pretty ridiculous anyway, so I had no qualms with it. I mean, no grace period and a minimum finance charge? Kind of dumb to charge someone a dollar interest on a pack of gum they paid off a day later! Worst part is, I’ve seen that card on blogger’s recommended cards lists! That sounds like a horrible offer! Good thing you closed the card. Thanks for your comment! I don’t mind the rate too much since I repay in full, but have also enjoyed some 0% periods, for which I have checked my score before applying to make sure it wouldn’t lead to a rejection. It is easy to bargain when you are in a good place, so if you know you are about to lose your job or won’t be able to repay in full each month, better call asap and negotiate than wait until you have missed a payment. Thanks for your comment Pauline. Great way to go too. Thanks for adding the tips to my post! Wasn’t aware that there was this much leeway in negotiations–thanks for the tips! My pleasure Mike. I learned this working as an interest rate negotiations specialist for a consulting firm that worked with both debts and investments. My job was to treat the reps like royalty as I negotiated better rates on $30,000 debts for my clients. It’s amazing how much 3 or 4 points saves big balances! “the representative on the other end of the line has a lot more power over your interest rate than you think. So, being polite is of the utmost importance ” – this is something that I can’t get it! Why the price, rate or anything should depend on my voice’s tember? I should receive the same price and rate as the rest no matter my attitude. I can agree that bad attitude breeds bad attitude, but it has nothing to do with the prices. This is discrimation!